Big Solar has been about Big Dreams – fields of mirrors carpeting the desert to produce clean, greenhouse-gas free electricity. But in another step toward making that vision a concrete-and-glass reality, Schott Solar announced Monday that it is building a factory in Albuquerque, N.M., to manufacture components for large-scale solar thermal power plants as well as photovoltaic modules for commercial rooftop arrays. The German company’s news follows Silicon Valley solar startup Ausra’s announcement last month that it’s building a solar thermal factory in Nevada — the first in North America. That solar companies are now investing capital to break ground on manufacturing plants represents the creation of a Big Solar infrastructure and, of course, a move to get on the ground floor of what is expected to be a solar building boom in the sun-drenched Southwest of the United States. Utilities throughout the region are facing mandates to dramatically increase their use of renewable energy. In California, for instance, PG&E (PCG), Southern California Edison (EIX) and San Diego Gas & Electric (SRE) are all negotiating big megawatt contracts for utility-scale solar power thermal power plants. A consortium of Southwest utilities meanwhile has put out to bid a 250-megawatt solar station. 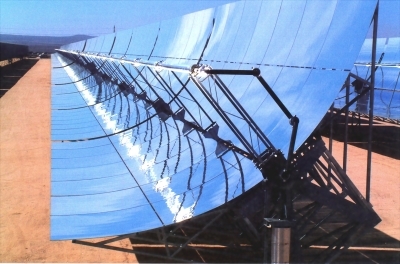 The $100 million Albuquerque factory will manufacture solar thermal receivers — long tubes that hang over curved mirrors called solar troughs. The mirrors focus the sun’s rays on the receivers and liquid inside becomes superheated to produce steam that drives electricity-generating turbines. Finocchario says the the plant, which will employ 350 people, is set to go online by the end of the first quarter of 2009. Future plans call for another $400 million investment to expand the factory’s workforce to 1,500.